How To Grow A Garden You’ll Want To Cook From! This post may contain affiliate links. If you click through and make a purchase we may receive a small commission at NO EXTRA cost to you! Have you ever had bumper crops of vegetables that you don't EVEN know what to do with? If the main reason for your garden is to provide food for your family then you'll need to know how to plant a garden you'll want to cook from! I'm so happy to be able to introduce you to Sarah from Sarah's Cucina Bella! A mouthwatering site with all kinds of delicious! What a perfect topic! Sarah is also the author of a mouthwatering cookbook ! So, for all you cooks who have at some point wondered what to do with your garden produce, here's how to plan better! A few years ago, my children and I started renting a garden plot from our city parks and recreation department. Since then, we’ve used it to grow foods both for eating immediately and storing for later. But we’ve also learned a few things not to do in that time. These days, we’re more judicious about when we plant and how much we plant. As we look ahead to our 2019 garden, we’re planning to triple our growing space so that we may grow even more of what we eat year-round. That means we’re planning more than ever. After all, not only do I want a garden that flourishes, I want one that is low-waste (we’re going to eat pretty much everything that grows, including lesser common greens like carrot tops and radish greens) and that gets me excited to cook from. Here’s how to grow a garden you’ll want to cook from. — How much space will you have for planting? How will you divide it up? Will you use square foot gardening techniques? Row plantings? Will you plant from seed or buy seedlings? Don’t wait until it’s planting time to decide these things. While that might work for the flower garden, when it comes to food more planning is better. — The size of your planting space will determine how many plants you can get in the ground. But that’s not the only factor. Duration of direct sunlight, average temperature, and average rainfall are important to factor in as well. Once you know these things, make sure the seed you are ordering will work in the conditions you have. — Those string bean varieties are tempting, but does anyone really need eight different varieties of beans in three colors? Well, maybe, but do think it out before you order and plant. As you plan your garden and order seeds consider what you’ll want to eat, make into jams, pickles, etc and store for winter. And while you are aiming for variety, don’t plant something you’ll ultimately not want to eat. Sure, those squashes are pretty, but if you rarely like to eat squash it’s better to buy from your local farmers market. Meanwhile, if you love tomatoes and have big plans for sauces, pastes and more, plant as many varieties as you want! — Here’s one important thing I suggest: as you record your seed varieties in your garden journal, also take note of what you plan to do with each of them. For instance, if you are planting beets, will you use the beet greens in stirfries and salads? Will you blanch and freeze some for the winter months? And will you eat all the beets in the summertime or are some destined for pickling and boiling to store? Having a planned light of what you will do with each item will be a help when you can’t possibly eat another carrot or when those tempting carrot greens look so nice (hint: eat them!). — Much like our overplanting of radishes shows, there is such a thing as too much. As you approach your 2019 garden, be careful to stagger your harvests. For some crops like carrots and beets, this means doing more than one planting so that they mature at different rates. For others, it means simply planting less. But also, importantly, pay attention to estimated maturing time. It can be overwhelming to have all the root vegetables reach maturity simultaneously. So, if you can, also consider switching up some plants with early varieties to ensure that things ripen on a more staggered schedule. Here in Maine, we’re deep in the throes of winter. But in our garden journal (and our seed company shopping bag), it’s all summer. I can hardly wait to start planting, harvesting and cooking from our garden. Sarah Walker Caron is the writer behind Sarah's Cucina Bella, a food blog that focuses on quick and easy from-scratch cooking. Thereshe also writes about her family's gardening adventures, travel, and favorite books. She's also the author of five books including The Super Easy 5 Ingredient Cookbook and One Pot Pasta. 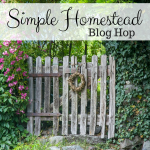 When she's not blogging, she is the editor of Bangor Metro Magazine and HelloHomestead.com. You might also want to check out her cookbook Grains as Mains! You might want to read more from Sarah . . .
Great information. This year is bit different for me so this will be very helpful.